Randy Boyagoda set out to write a “sympathetic yet critical-minded” book and he has done just that. 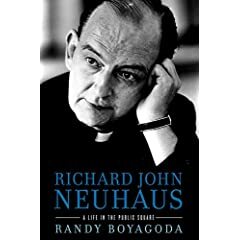 His new biography, Richard John Neuhaus: A Life in the Public Square, takes seriously the Christian faith according to which Fr Neuhaus ordered his life and work. The result is an authentic and compelling portrait of a man who had as much influence as any in the 20th century on the place of religion in American public life. Boyagoda’s success is no small feat considering the particulars of the life in question. Neuhaus was a prominent public figure for the better part of five decades—from the 1960s until his death in 2009. His writings are voluminous and cover a remarkable breadth of subjects. So wide and varied are the events and controversies in which Neuhaus played a part that it would be easy for an author to lose his subject, or his readers, amidst all the twists and turns. Through a complicated and wide-ranging biography—a childhood in small-town, depression-era Canada; boarding school in Nebraska (he was “asked not to come back”); “knocking about” in Cisco, Texas (Neuhaus owned and operated a gas station at age 16); back to school; to seminary in St Louis; to a poor parish in Brooklyn; and eventually to a long tenure on the national stage—Richard John Neuhaus comes more clearly in focus, not less. This is a credit to Boyagoda’s sensibilities as a writer and storyteller and to his willingness to take seriously Neuhaus’ own accounting for his life and work. That life and work played out in the service of many causes and was marked by several important conversions. He was a Lutheran pastor—the son of a Lutheran pastor—who converted to Catholicism in his sixth decade. He first came to national prominence during the civil rights movement as the outspoken pastor of a poor black church in Brooklyn. He agitated, marched, pledged, and protested—for social justice and against the Vietnam War—even getting arrested during the tumultuous 1968 Democratic convention in Chicago. He saw the pro-life movement as a natural corollary to the civil rights movement and was a fierce defender of the unborn. As Neuhaus watched liberal Christianity hollow itself out from the inside, he found himself more and more at odds with the movements (and politics) that had brought him to prominence. By the time he published The Naked Public Square in 1984, he was at the forefront of a growing, largely conservative, resistance to what he saw as the theological denuding of American public life. It was his founding and editing of the journal “First Things,” the goal of which was and is the articulation of an alternative—stands as his greatest contribution to American public life. Neuhaus was fond of quoting T.S. Eliot’s line: “If we take the widest and wisest view of a Cause, there is no such thing as a Lost Cause, because there is no such thing as a Gained Cause.” The many causes to which Neuhaus joined his efforts were always secondary when considered against the background of “the widest and wisest view”—an unmistakably religious vantage point, he would insist. Readers looking for a thorough evaluation of Neuhaus’ legacy will not find it in this book. The book ends immediately, almost abruptly, with Neuhaus’ death on January 8, 2009. That the ongoing debates over the role of religion in public life have only intensified in the years since his death serves to underscores and confirm Neuhaus’ insight into the necessary role of religion in public life and the myriad threats to that role. Unless informed by the truth about man—a truth that is distinctively, irreducibly religious—our political, economic, and social institutions will crumble under their own weight. The faithful Christian, then, is not just a good citizen but the best—acting for both the worldly and ultimate good of his neighbor, and living the virtues necessary for freedom to be lived well. In the last analysis, a Christian who fails to labor for the political good, fails in charity. The generation now coming into its own is one whose experience of American life consists of costly wars overseas and the unravelling of family and economic life (to say nothing of religious freedom) at home. This is a generation that stands to learn a great deal from the life of Richard John Neuhaus, and his insistence—in word and deed—that the world cannot afford for us to forget wherein our true hope lies. Stephen P. White is a fellow in Catholic Studies at the Ethics and Public Policy Center in Washington, DC and coordinator of the Tertio Millennio Seminar on the Free Society. This article is published by Stephen P. White and MercatorNet.com under a Creative Commons licence. You may republish it or translate it free of charge with attribution for non-commercial purposes following these guidelines. If you teach at a university we ask that your department make a donation. Commercial media must contact us for permission and fees. Some articles on this site are published under different terms.